Sales: on-farm, you pick (check website for schedule), farmers’ markets in Tahoe City, South Lake Tahoe, and Sacramento. Grocery stores in Tahoe and Newcastle Produce. Restaurants in Auburn & Tahoe. 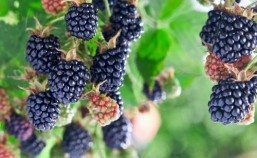 Products: Raspberries, thornless blackberries, boysenberries, olallieberries, blueberries, chestnuts, pomegranates, kiwi, mandarins, pumpkins, squash, tomatoes, loquats, persimmons, figs, rhubarb, cherry plums, Meyer lemons, apples, applewood, olives, herbs, flowers, corn, popcorn, guava.